Relatively few of Yellowstone National Park's innumerable summits are accessible by trail, and only five are within reach of a relatively short (half day) hike - Observation Peak and Mount Washburn in the Canyon area, Bunsen Peak and Sepulcher Mountain near Mammoth Hot Springs and Avalanche Peak in the east. 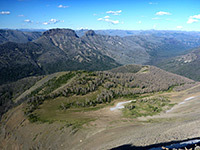 This 10,568 foot mountain is part of the Absaroka Range, along the eastern boundary of the park, and the views from its rocky, treeless summit are quite spectacular, encompassing many other remote peaks and valleys, with Yellowstone Lake to the west and the distant Teton Range to the south, 50 miles away. The hike to this point is short (2.5 miles) but steep, gaining 2,120 feet largely without any switchbacks. The first part is through thick forest, which gives way to bushes and meadows, and then to a barren scree slope for the final half mile, a section often cold and wind-swept even in summer. This high elevation area of the park, little-visited compared with places further west, is a favored region for grizzly bears, in particular around the upper reaches of the forest along the Avalanche Peak Trail, since the animals feed on cones from the whitebark pines that grow here near the treeline. 9 views along the Avalanche Peak Trail. 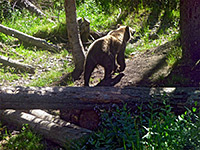 Grizzly bear at the Avalanche Peak trailhead (mp4; 0:20 min; 5 mb). The trailhead for the path to Avalanche Peak is at a picnic area along the East Entrance Road adjacent to the west end of Eleanor Lake, a short distance west of 8,541 foot Sylvian Pass, the second highest section of road in the park (after Mount Washburn). The trail is well enough marked but narrow, and steep from the beginning, climbing through dense, dark, overgrown woodland where the pine, fir and spruce trees are tall and grow close together, mixed with many fallen trunks and large boulders. Unlike most other mountain routes there are few switchbacks and instead the path heads directly up the hillside, ascending just east of a small stream. The surface underfoot is often uneven, with loose stones and exposed roots. There is a brief respite in the climb when the path descends slightly to an open area around the creek, before re-entering the woods and becoming steep again, as the forest gradually thins out and the trees are less tall, the surroundings brighter. 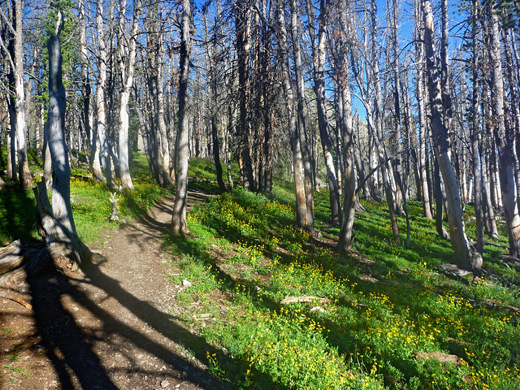 One section traverses an area of dead whitebark pines, allowing sunlight to reach the floor, which is covered by a lush blanket of green grass, dotted with yellow flowers in summer - a pretty scene. The trail is noticeably less steep as it passes the treeline and reaches a meadow in sheltered basin, from where the summit first comes properly into view, still nearly 1,000 feet above. A high ridge runs southeastwards from the peak, linking with an adjacent summit (Hoyt Peak); both are exactly along the east boundary of the park. The path crosses another small cluster of trees, twisted and weather-beaten, then heads up a scree slope with a few bushes to a second, smaller basin covered by short grass and scattered rocks. 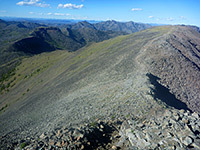 The final section to the summit is all across the scree, which is formed of small, sharp rocks that are quite firm to walk over. At the top are the remains of a stone shelter, beside the first of two adjacent summits; the other is a few hundred feet away further north, also with an old shelter. The views are slightly better from here, as the peak overlooks a steep-sided, north-facing ravine holding a small glacier, at the upper reaches of Crow Creek valley. Otherwise, the vista is fairly similar in most directions (see 360 degree panorama) - mile after mile of jagged peaks, long valleys and sheer cliffs, interrupted only by the hazy expanse of Yellowstone Lake to the west.